Of the 31 communication satellites that ISRO has turned out so far, 19 were sent on Ariane rockets, 10 on GSLV, 1 even on PSLV and, earlier this month, GSLV Mark III successfully launched its first such satellite. 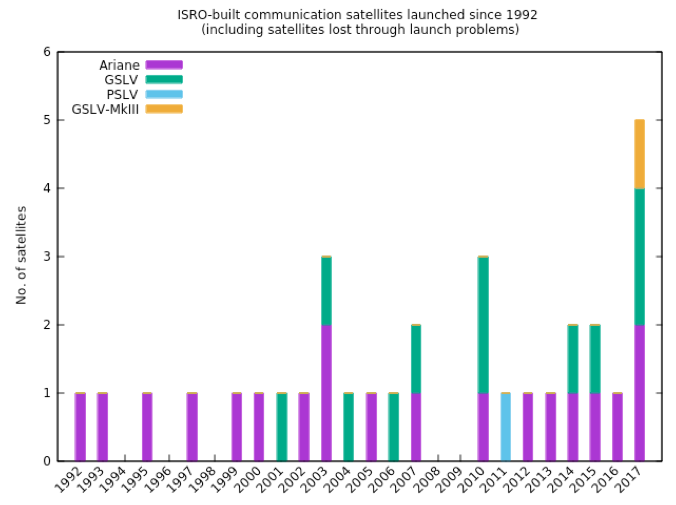 Three of the satellites that went on the GSLV were lost on account of launch failures and one had to be written off after becoming stranded in a lower-than-intended orbit. As the graph above indicates, this year is likely to see ISRO launching a record five communication satellites. Three have already been sent into space in rapid succession: the GSAT-9 or South Asian satellite in May, followed by the GSAT-19 on the GSLV Mark III and now GSAT-17 this month. The GSAT-6A, intended for the defence services, will go on a GSLV Mark-II rocket, possibly in September. GSAT-11, which will be the heaviest communication satellite built thus far by ISRO, weighing about 5.8 tonnes, is expected to be launched on an Ariane 5 rocket at the end of the year.